The review year has started again, and we are back with another review from Heirloom Audio Productions. 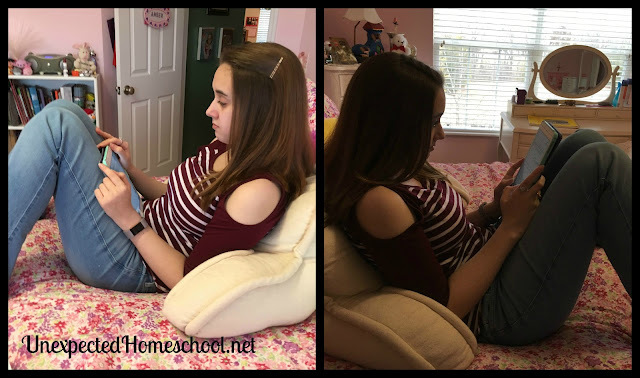 Although Amber is nearly halfway through high school, Heirloom Audio Productions remains one of her favorite vendors to review. This time in Wulf the Saxon we traveled to Anglo-Saxon England to witness the Norman conquest. Heirloom Audio Productions has transformed numerous G.A. Henty adventures into their active listening format. These are not simply audio books with a story being read, nor are they quite the same as audio dramas that you may have heard on the radio or as recordings. Instead, active listening audio adventures take quick paced adventures and bring you into the story through sound only. The effects encourage you to create images in your mind, to where you do not even realize there is not a video component. The experience is unlike any other listening format. 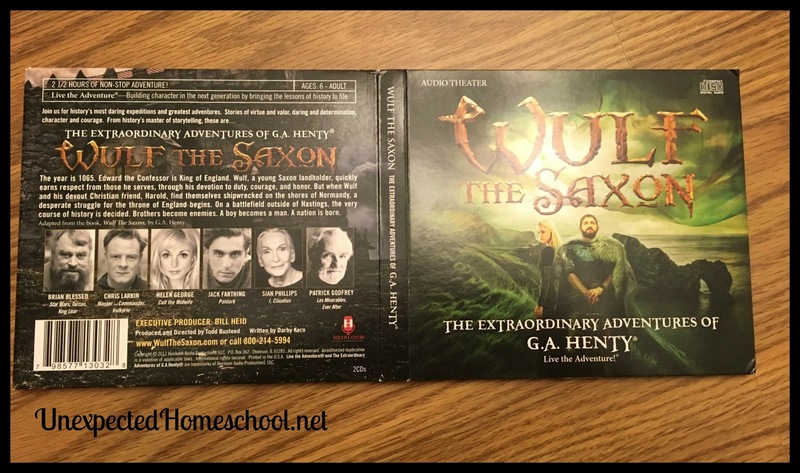 We received Wulf the Saxon as a two CD set, however Heirloom Audio Productions also publishes these adventures as MP3s on their website LiveTheAdventureClub.com where you can download or listen online. 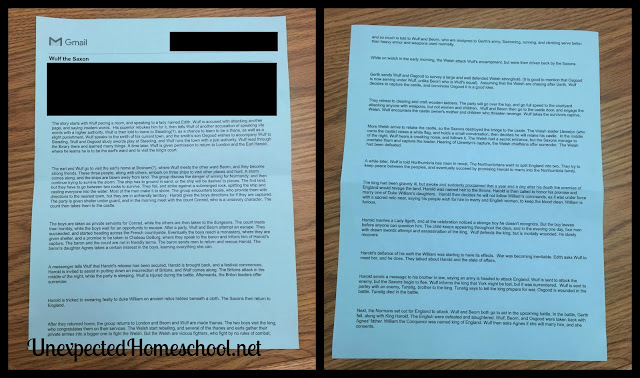 In addition to digital files, Live the Adventure Club provides bonus content for each story in the form of study guides, e-book versions of the G.A. Henty novel, sound tracks, and more. We have been more than pleased in the past with our access to Live the Adventure Club. G.A. Henty was a late 19th century English novelist who mostly wrote historical adventure novels for children. Being well traveled and having spent time in the British army gave Henty some of the perspective needed to write such detailed stories. He also was known to do extensive research prior to writing his historical novels and all use history to teach moral values. That research is the key which has allowed Henty's stories to remain relevant today as vivid, historically accurate (for the most part) tales for all ages. 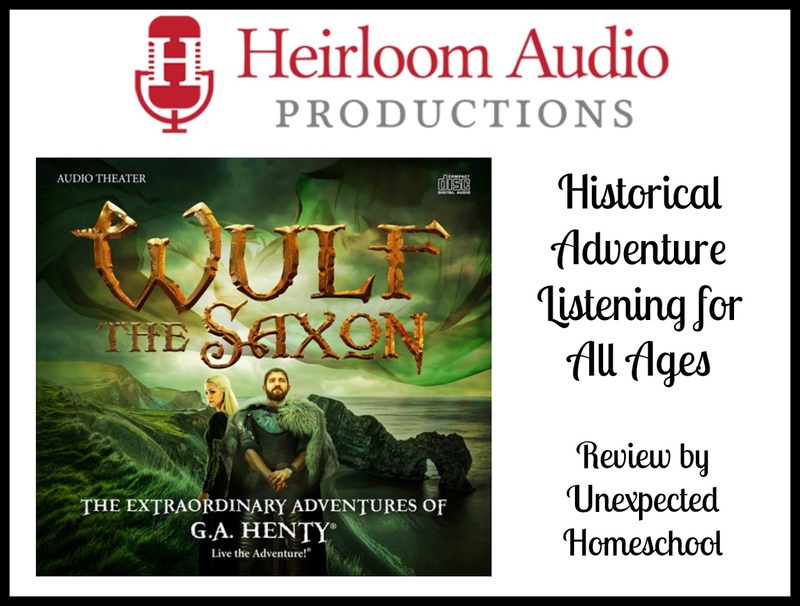 Although Amber is sixteen years old and in tenth grade, we still love to use the Henty dramas from Heirloom Audio Productions as history supplements. The dramas are designed for ages 6 to 16, but are even enjoyable for adults, to which I can attest. They are a good way to change up the learning methods we use, and give Amber a little break from her regular studies. Normally, Amber does not fare well without a tactile experience in her learning and has significant issues with auditory processing. Still, we have found the active listening experience that comes from Heirloom Audio Productions to be a great fit for Amber. She retains the information because she is able to create a picture in her mind of the story. Lately, I've been having Amber also take notes while she listens, in order to practice her listening and note-taking skills. Amber listened to Wulf the Saxon in one sitting of roughly two and a half hours, which was nearly too long for her to focus. Nevertheless, she managed to take notes on the entire story and hit most of the important points. Because of the way her mind turns these stories in to visuals, she often listens to a large section before pausing the CD to write down a summary of that portion. Ideally, she will get to the point where she takes constant notes. The story revolves around a young Saxon thane named Wulf of Steyning serving Earl Harold, who later is to become King Harold Godwinson. Wulf and another of Harold's wards, Beorn, are sent on numerous adventures in the service of Harold where they learn about loyalty and courage. Their first adventure is when the two along with Harold are shipwrecked in Normandy, which is unfriendly territory for Saxons. As things continue to decline the trio is captured and eventually the boys are taken as servants for Count Conrad of Ponthieu, while Earl Harold is imprisoned in the count's dungeon. The boys remain faithful to Harold and watch for a chance to escape, which they are able to do after a party. Then Wulf and Beorn find their way to Baron DeBurg who sends men to successfully rescue Harold. After returning home to London the two thanes, Wulf and Beorn, along with Wulf's friend Osgod who serves under him, are dispatched to help with Welsh rebellions. However, the Welsh are vicious fighters who do not fight by rules of combat. Heroically, Wulf, Beorn, Osgod and the Saxons are able to take a Welsh castle owned by the Welsh leader, Llewelyn. This leads to the ending of the Welsh rebellion. Harold eventually marries, but it is not to one of Duke William of Normandy's daughters as he originally swore when previously tricked by Duke William. Harold's defiance of the furious William begins to have effects and war between the two becomes inevitable. Wulf is wounded defending King Harold during one assassination attempt, but he slowly recovers. News of an attacking Norwegian Army, which includes King Harold Godwinson's brother, Tostig Godwinson, reaches Harold who sends Wulf and company to join in the attack at the Battle of Stamford Bridge where Osgod is wounded. Even though the Saxons were able to repel the Norwegian forces and Tostig is killed, another battle looms with William of Normandy. Wulf, Beorn, and Osgod aid Harold in the Battle of Hastings where the Saxons are soundly defeated and Harold is killed. William the Conqueror is named King of England. Our three heroes survive the Battle of Hastings thanks to Baron De Burg who is charged by William the Conqueror to keep them in safe custody. He takes them back to his home in Normandy, where they are all happily greeted by the baron's family. The loyalty and courage of the boys (now men) to Harold is rewarded by William, who understands the importance of these traits. Even though English history is not a favorite of Amber's, she thoroughly enjoyed Wulf the Saxon. She does still hold another of the Heirloom Audio Productions audio dramas as her favorite, while I prefer English history and Wulf the Saxon. Nevertheless, we have yet to be displeased with any of the Henty Adventures from Heirloom Audio Productions. We can't wait to see what Heirloom Audio Productions has in store for their next adventure! Other members of the Homeschool Review Crew also reviewed Wulf the Saxon. Please follow the link in the graphic below to read their thoughts.